The Close Your Door safety initiative comes as the result of over 10 years of research by the UL Firefighter Safety Research Institute (FSRI). After proving that a closed door could potentially save lives in a fire, UL FSRI has committed to share this finding with the world. The Close Before You Doze campaign features a consumer-facing website that includes safety tips, fire facts, news and a pledge, where participants can commit to closing their doors before they doze. A closed door provides a layer of protection between you and a fire, which is especially important at night when family members may be vulnerable with little time to react. Watch the video below to see how fire spreads in a home with doors closed and a doors open. 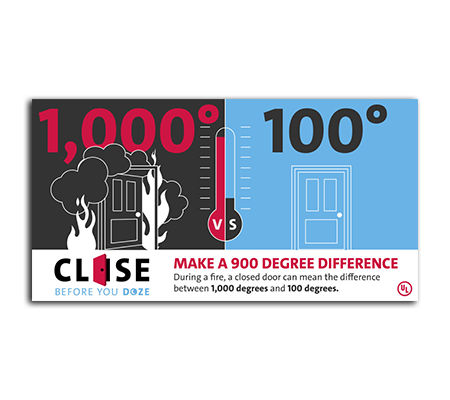 Visit the Close Your Door website or NFPA website for additional information on fire safety.